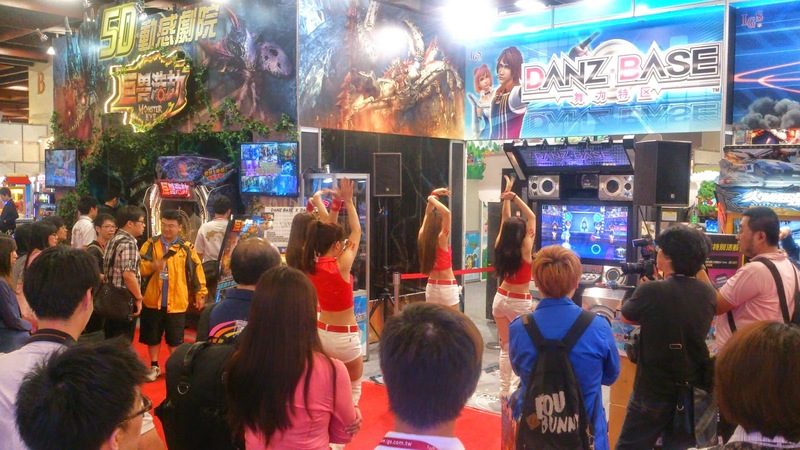 Danz Base was featured at the GTI Taipei 2014 Trade Show with the usual demo team of female dancers. This Chinese-based #exergame appears to be a 2-player game but can be linked to another machine (online?) to become a 4-player game. Similar to DanceEvolution (feturered previously) it uses a camera-based sensor to detect game player movement and award points and achievements. 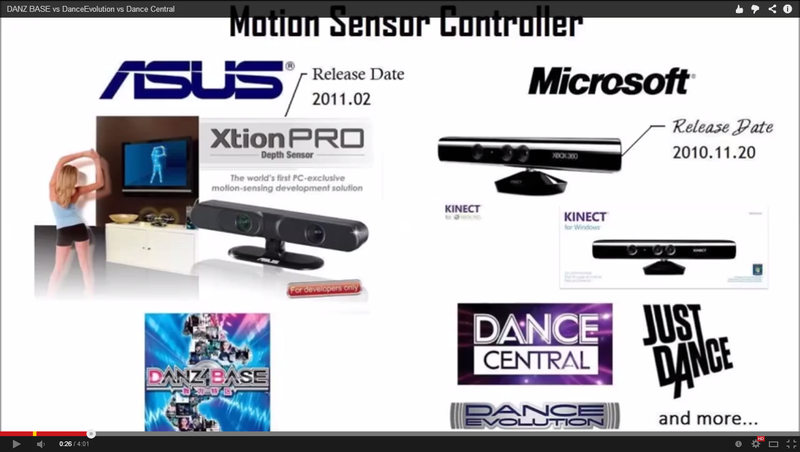 After watching the third embedded video, apparently they are using an ASUS Xtion PRO Depth Sensor while the other units (DanceEvolution & Dance Central) use the Kinect (both PC versions). 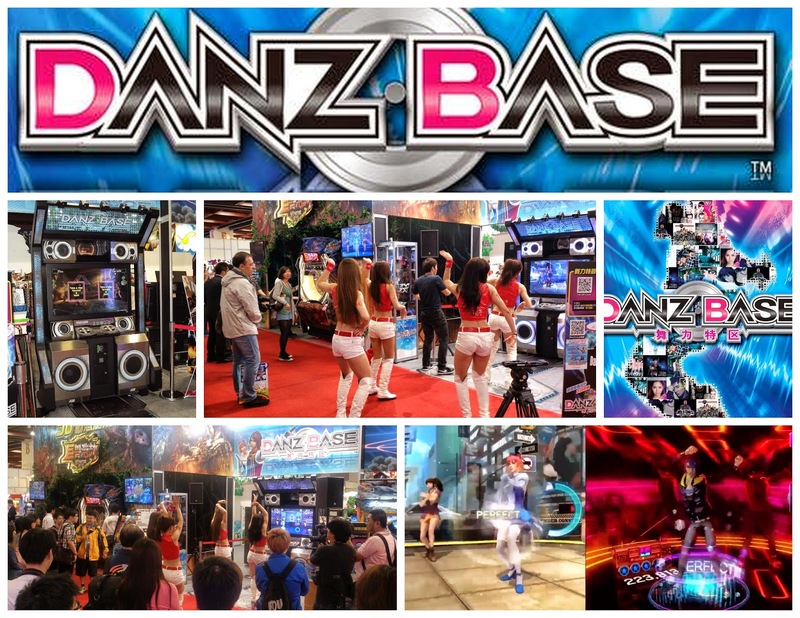 -Danz Base is a new and interactive two players’ somatosensory dance machine from IGS. The game features with motion sensing, interactive lights and double woofer functions, and 4 players are available to play a game at the same time through video with the Global Network function. -Besides, the abundant music in this wonderful machine includes popular songs from all over the world, America, Europe, Korea, Japan and amount vast productions from China, fun for new beginners and experienced players. 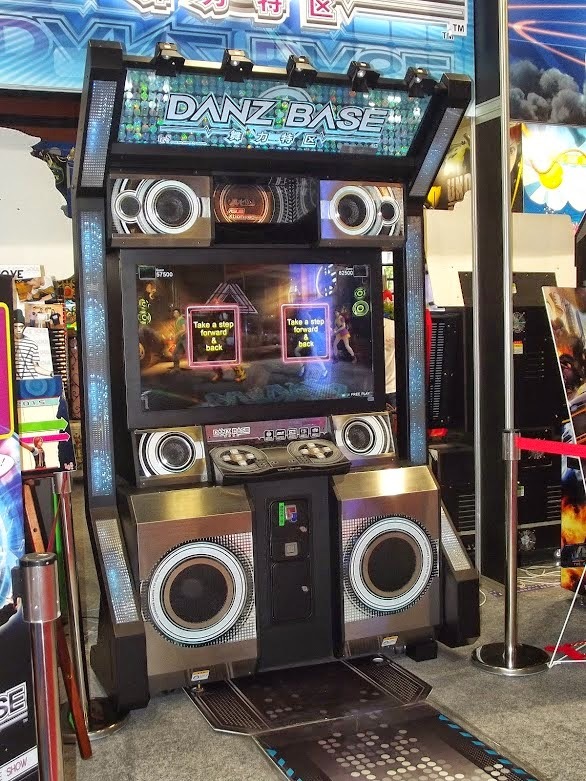 -Danz Base with the unique ARKOPAZE system: based on lendon, offering players interactive service on multi machines, allows player to exchange award on other machines like Muzibox DJ when reach achievements on Danz Base. Its clear from the videos, the dancers are are auto-generated or simply duplicated from the main dancer. Very different from the more complex motion-capture (high-res) dancers and multi-player sequences as seen in Just Dance. I think their choice of using the term "somatosensory dance machine" interesting given that all video games are somatosensory (multiple senses) and this game is is primarily only visual and auditory. 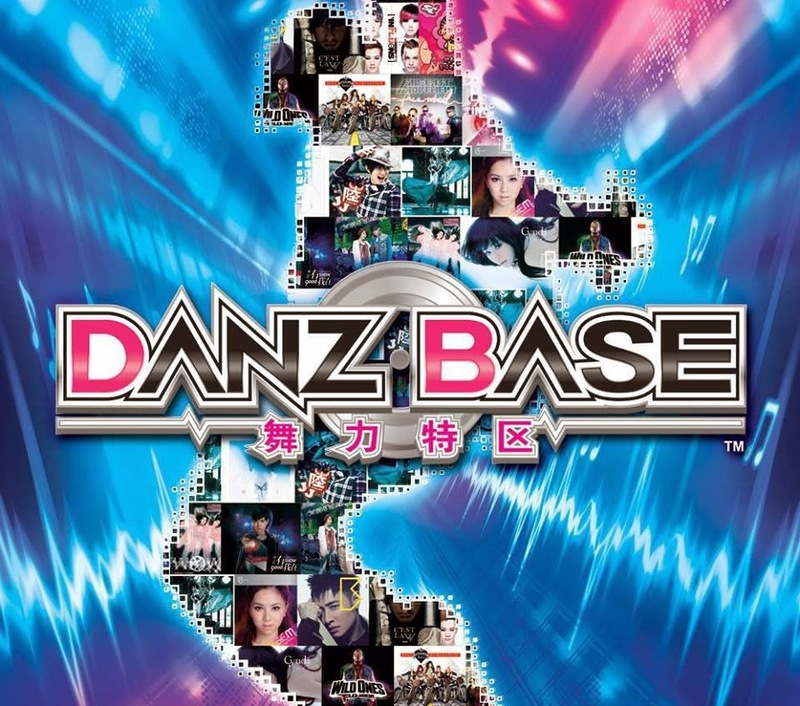 According to the description on one of the distributor websites, Danz Base uses an ARKOPAZE system that will enable users to collect awards and use them on Muzibox DJ. Its too bad we don't see more interoperability between machines, gamer profiles, companies as game consoles. We're really missing out on the ability to share with details of our amazing dance conquests, perfect routines and overall fitness data. In watching the 3rd video, gameplay footage clearly shows some interesting comparisons in providing feedback which I didn't pick up until they were placed side-by-side (see screenshot below). 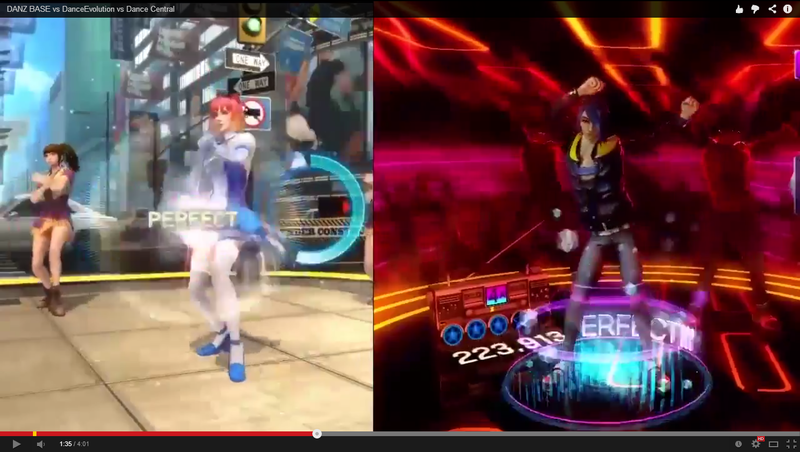 Besides the audio, Dance Central provides "visual" feedback at the point of the dance move (hands, hips, feet) whereas Dance Central only provides "visual" feedback but it rotates around the "virtual lead dancer" and is sometimes not visible. The other factor that makes visual feedback on Dance Central more cluttered is the cumulative score, and star levels nestled to the left of the "virtual lead dancer". Using fitness video games can be a fun and engaging way to keep an active lifestyle fresh and entertaining. Remember if its not fun to do, you probably won't do it consistently and that's not a good thing. Fitness matters, and we need to find more ways to stay active and make healthy choices with food and emotion. Thanks to Arcade Heroes and their great coverage on arcade installations and releases all over the world.